Friends or family coming in from out of town for a visit? Below is a guide to a variety of fun and exciting places to take out of town visitors in Boulder. We’ve got you covered from amazing places to enjoy the great outdoors to kid friendly activities to all the best spots to enjoy Boulder’s quirky side. Enjoy! The most beloved aspect of Boulder is the natural beauty of the valley and its breathtaking views of the foothills and flatirons. With 110 miles of walking and hiking trails on over 35,000 acres of protected land, the possibilities for outdoor recreation in Boulder are endless. Hikers will adore Chautauqua’s meandering trails, NCAR’s scenic pathways and challenging treks up Mount Sanitas, Bear Peak (pictured) and South Boulder Peak. Boulder is packed with dedicated bikeways (over 300 miles!) in the city and throughout openspace. If your out of town visitor prefers a more relaxing way to enjoy Boulder’s vistas, check out the rooftop bar at the West End Tavern to enjoy a fresh craft beer and that unbeatable view of Boulder’s flatirons. Next, take your guests to check out Boulder’s quirkier side by visiting a classic Boulder hotspot. 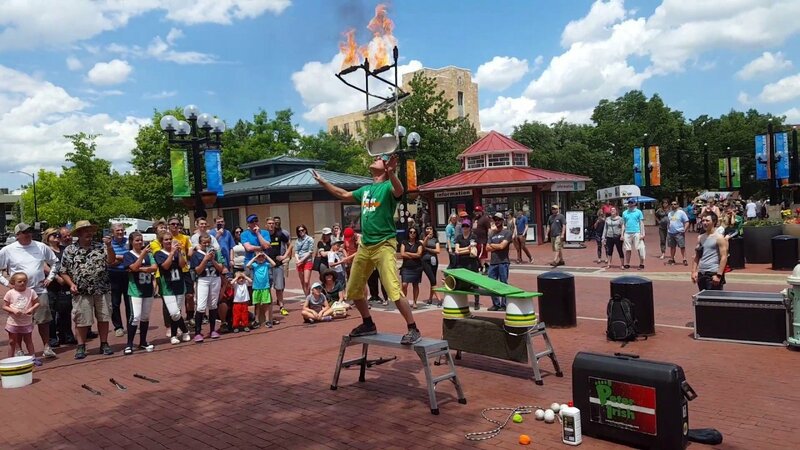 The Pearl Street Mall is a great place to get a taste of Boulder’s character, with street performers and lots of choices for shopping and dining. Take a break in the gorgeous Boulder Dushanbe Teahouse, sip some tea and relax in the rose garden. Drive up Flagstaff Mountain to get a breathtaking view of the front range. Take a stroll or have a picnic at Chautauqua Park! To give your out of town guest a feel for Boulder’s history as well as experiencing fascinating exhibits, visit the brand new Museum of Boulder. With all this running around, visitors are sure to get hungry. Boulder is home to some of the most drool-worthy food on the planet. Start your day at Boulder breakfast spot, The Buff, for a homestead skillet, a cappuccino or a tequila sunrise. Head downtown to try The Boulder Med‘s extensive tapas menu, as well as a variety of Italian, French and Greek specialties. To satisfy your sweet tooth, stop by Colorado-based Sweet Cow Ice Cream in South Boulder, North Boulder or Louisville to choose from 24 delicious small batch ice cream flavors. Boulder is home to some of the best craft breweries in Colorado, and sampling a local brew is essential for visitors. Take visitors to Boulder hangout, the Rayback Collective, with over 30 beers on tap (including many of the local favorites) as well as a “backyard party” space complete with games, fire pits, and a chill vibe. Or go straight to the brewery! Boulder Beer is heralded for being Colorado’s first craft brewery, featuring favorites like Hazed Hoppy Session Ale, Mojo IPA, and Shake Chocolate Porter. If you are interested in checking out something a little more low key and different, stop by Cellar West Artisan Ales in North Boulder, a microbrewery that specializes in farmhouse ales. For a complete guide to the breweries of Boulder, click here. Looking for kid-friendly activities in Boulder? In addition to the outdoor activities and classic Boulder favorites listed above, there so many more ways keep kids entertained in Boulder! Gateway Park Fun Center is a kid’s dream come true (and so fun for adults too!). Opened in the 1980s, this park has maintained tons of original features, giving it an eclectic, old school feel that will bring you back to your childhood with activities like go karts, mini golf, batting cages and an arcade. The University of Colorado’s Museum of Natural History is educational, interactive and fun for the whole family. In the lower level, kids will have a great time in the interactive play and learning area while adults can enjoy a nice, free cup of coffee or tea in the museum’s BioLounge with comfortable seats and inviting atmosphere. At NCAR’s Visitor Center, kids can learn about weather and climate with interactive displays — play with clouds, create a tornado and learn about our planet! If you are looking for kid-friendly local events, check our Boulder Kids Weekend Guide – a weekly guide with all the kid-friendly events happening in and around Boulder each weekend. For our list of family-friendly restaurants, click here. Boulder has a handful of music venues around town, as well as lots of opportunities to see local musicians perform at nearby breweries and restaurants. During the summer, music lovers flock to the Chautauqua Summer Concert Series, to see musicians play in a stunning setting. In 2018, the line-up includes Mary Chapin Carpenter, Amos Lee, Ziggy Marley and The Weepies. On Wednesdays throughout the summer, check out Bands on the Bricks on Pearl Street (lineup here). Twenty Ninth Street hosts Twenty Ninth Street LIVE on Fridays and Saturdays throughout the summer (lineup here). In addition to these summertime venues, Boulder Theater and the Fox Theatre host local and national musicians all year long.